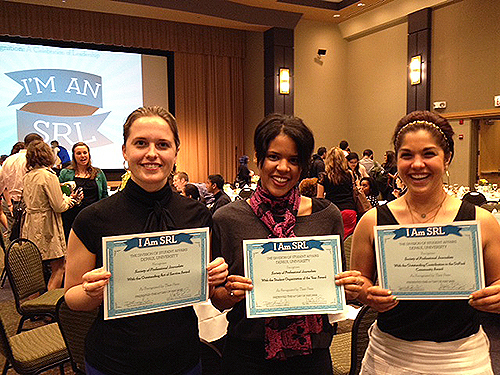 SPJ DePaul executive board members (from left) Ali Trumbull, Monica Carter and Monica Kucera with their Socially Responsible Leaders awards. SPJ DePaul won three awards May 30 at the DePaul Student Leadership Institute’s Socially Responsible Leaders recognition dinner. The student chapter of the Society of Professional Journalists won awards for two events and received honorable mention honors for campus organization of the year, an award it won two years ago. SPJ DePaul won in the Outstanding Contributions to the DePaul Community Award for its Twitter 101 training with Mark Luckie, Twitter’s director of news. The chapter partnered with the Chicago Sun-Times for the event. The chapter also won in the Community Service category for its social media training event for high school students at Gordon Tech. SPJ DePaul has won seven campus leadership awards in the past three years.